When we saw AMD’s Trinity, we were quite impressed with what the chipmaker did with the CPU section. Trinity’s CPU half uses the Piledriver core, which has fixed and improved upon the rather lackluster performance of Bulldozer. Trinity delivers respectable performance that finally moves AMD forward. We were expecting the desktop Trinity line to launch sometime in the first half of 2012, but after a few months of delay, we can now see whether the desktop Trinity shows the same promise we have seen in the mobile version. 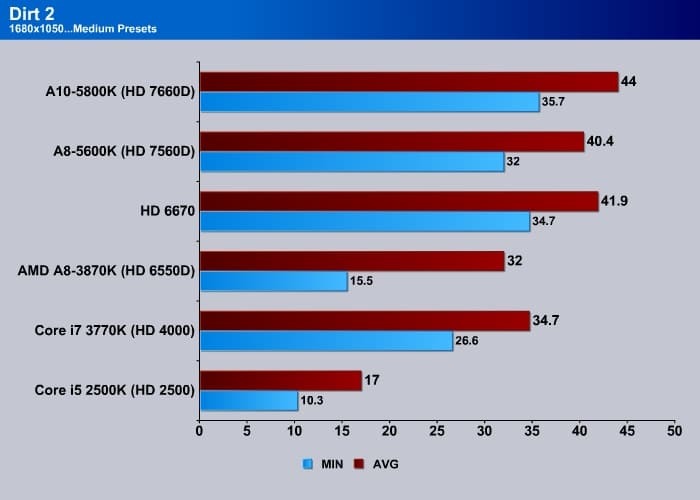 The slide above comes from AMD that shows the performance gain for the A10 Trinity compare to the A8 Llano where we see a 37% gain in the 3DMark11 and 25% gain in the PCMark 7. You would have to wait a few more days until we can show you our result but for now we can give you some information about Trinity and show you the GPU performance. We know that Trinity will come with the Piledriver CPU module and the VLIW4 GPU. On the CPU front, each Piledriver is built on the same design as Bulldozer: each module features two integer units and one float-point unit. 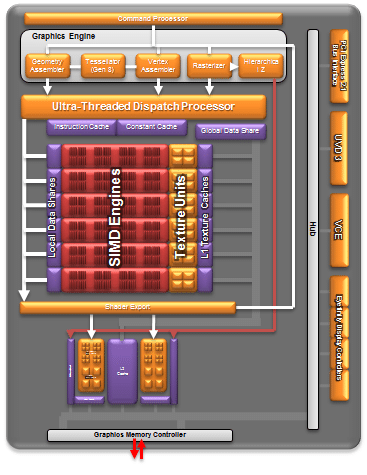 AMD has done quite a lot of work tweaking Bulldozer, and has improved almost every aspect of the architecture. The result is that Piledriver is a much more efficient machine. This should show a gain that hopefully will be able to deliver a much better performance over the old K8 architecture found on Llano, making Trinity more competitive against Intel’s offering. The GPU on the Trinity also sees a big improvement, but it’s not radical by any means, as AMD just borrowed the same VLIW4 design found on Northern Islands (the same as on the HD 6000 series). Since AMD is already ahead of Intel on the GPU front, it is not a big surprise to us that AMD took the logical step of borrowing the VLIW4 as opposed to the Graphic Core Next design on the current HD 7000 series GPU. We have seen the VLIW4 design is a much more efficient GPU over the VLIW5, so AMD is again able to further advance its lead over Intel on the GPU front. The GPU features 6 SIMD engine with 16VLIW4 array for up to 384 Radeon cores. The GPU features 24 texture units and 8 ROPs.As expected, the features on the GPU is exactly the same as the Radeon HD 6000. We get DirectX 11, OpenGL 4.1, OpenCL 11, Eyefinity support. In fact, this is the first processor supporting 3+1 displays when using DisplayPort 1.2 port. The AMD Universal Video Decoder (UVD3) is here as well for helping decode video . What is new here is the addition of the hardware encode component, which has been borrowed from the Graphics Core Next’s Video Codec Engine (VCE). This should help out with transcoding multimedia and hopefully delivering performance comparable to QuickSync on Intel’s Sandy or Ivy Bridge. When desktop Trinity is launched, AMD will have A10, A6, A8, and A4 models available. It will also have the K series with an unlocked multiplier for overclockers. The desktop APU will fit in the 65W or 100W TDP envelope. 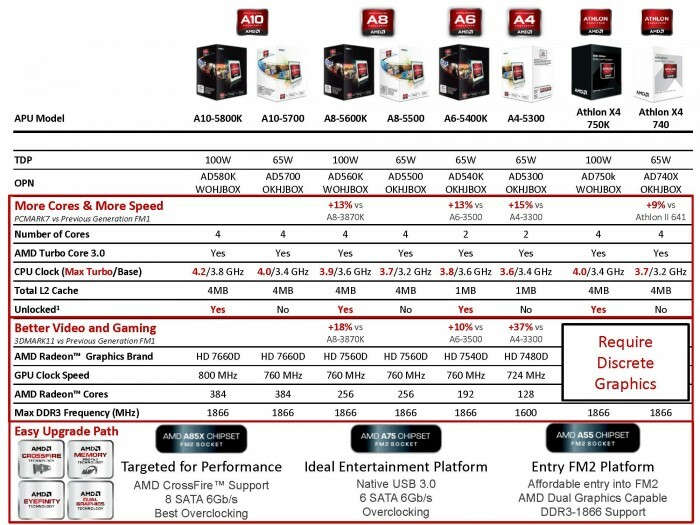 The A10 and A8 will come with 4 cores (2 modules) and the former will feature HD 7660D GPU with 384 Radeon cores clocked at 800 MHz while the latter will come with HD 7560D with 256 Radeon Cores clocked at 760 MHz. 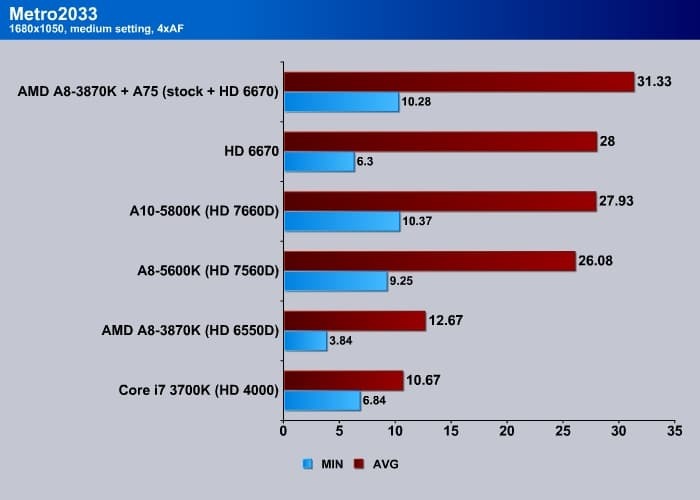 The A6 and A4 series will be dual cores (or one module) where the A6 will have the HD 7540D GPU with 192 Radeon Cores clocked at 760MHz and the A4 will have HD 7480D with 128 Radeon Cores clocked at 723 MHz. Notice on the chart above, there is even an Athlon X4 models available that features four cores but without the integrated GPU. 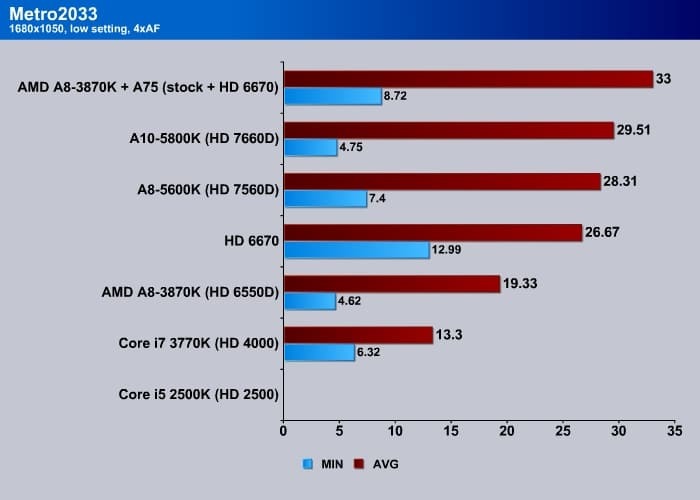 AMD has not released the pricing of the A8 and A10 desktop APU but it is expected these APUs to be competing with mainstream market Intel Core i3 processors, so we should expect the top of the line APU’s to be priced at maybe just a little over $100. While we still cannot unveil all of the details and benchmarks on Trinity (that will have to wait just a few more days until the official embargo has been lifted), we are able to bring you some preliminary benchmarks on the GPU performance on the desktop A8 and A10 chips. 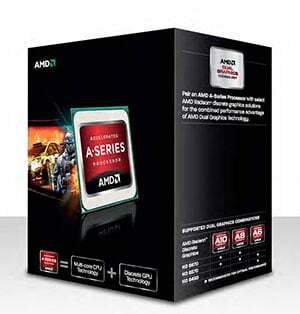 The top of the line Trinity A10-5800K is clocked at 3.8 GHz base speed with the ability to turbo to 4.2 GHz. The A8-5600K we received has a base clock of 3.6 GHz with the ability to turbo up to 3.9GHz. 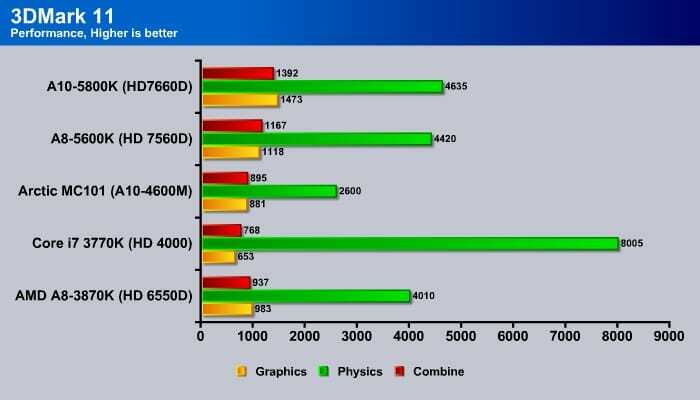 We already know that Intel’s latest HD 4000 GPU is almost as fast as the HD 6550D found on the Llano APU, so it should not come as a big surprise that Trinity’s GPU performance takes AMD even farther ahead of the game in the GPU front. 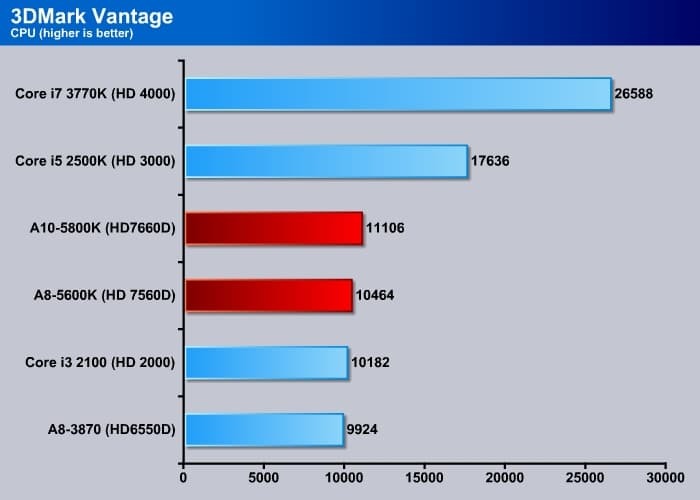 Much like what we observed with the transition from the HD 5000 (VLIW5) to the HD 6000 (VLIW4), the GPU improvement is significant on the Trinity despite having fewer cores than Llano. 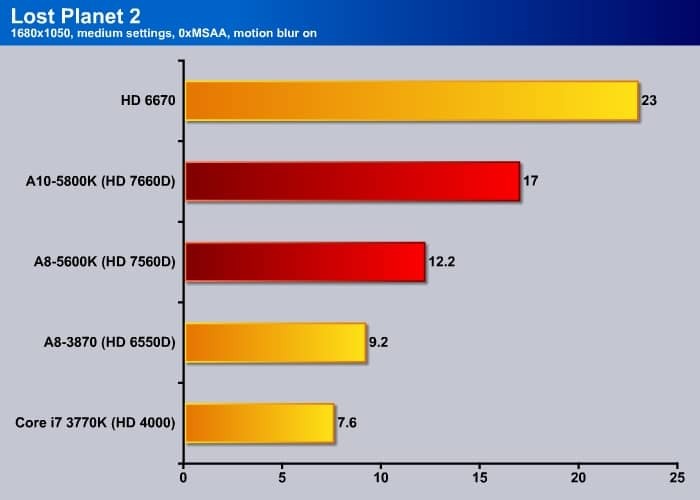 The HD 7560D on the A8-5600K delivers about a 10-20% gain over the HD 6550D on the A8-3870. 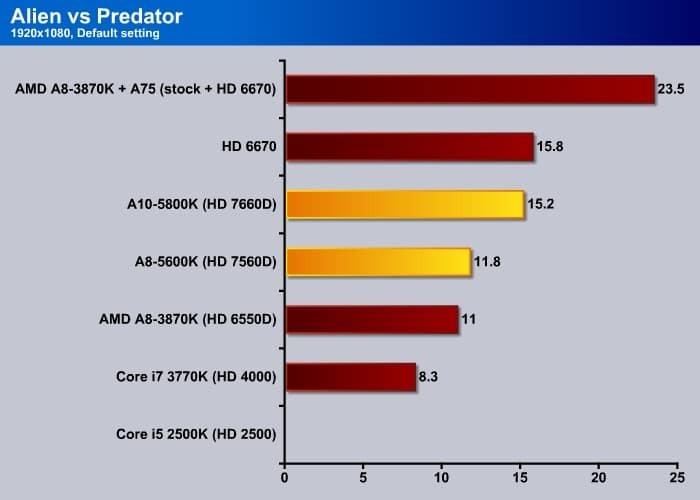 AMD expects the A10-5800K’s HD 7660D to deliver about 20% more over the HD 7560D, or about 40% gain over the Llano. 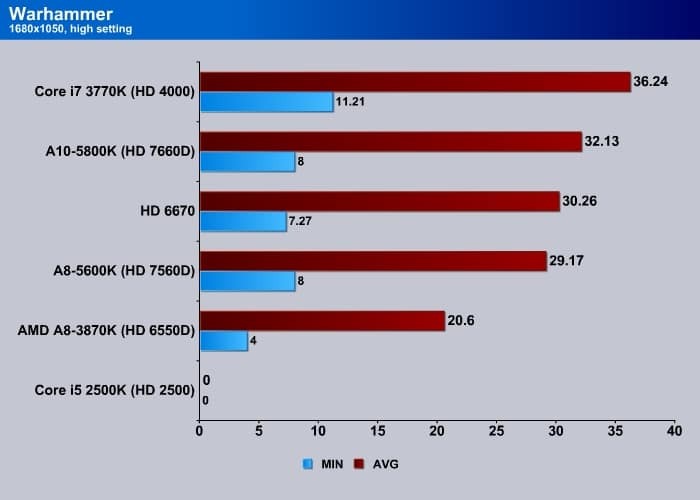 We also put the HD 6670 as a comparison here and we can see that the A8-5800K is actually able to deliver about the same performance as the HD 6670 or $50 budget GPU performance. With Trinity, AMD is getting really close to delivering a great integrated GPU for us. For most part, the GPU on the Trinity is decent enough, playing games at 1680 x 1050 with mid to high level, where it is capable of delivering 30 FPS. The APU is almost good enough to play Metro 2033 at 1680 x 1050 low setting, just a tad shy of the 30 FPS needed for smooth game play. 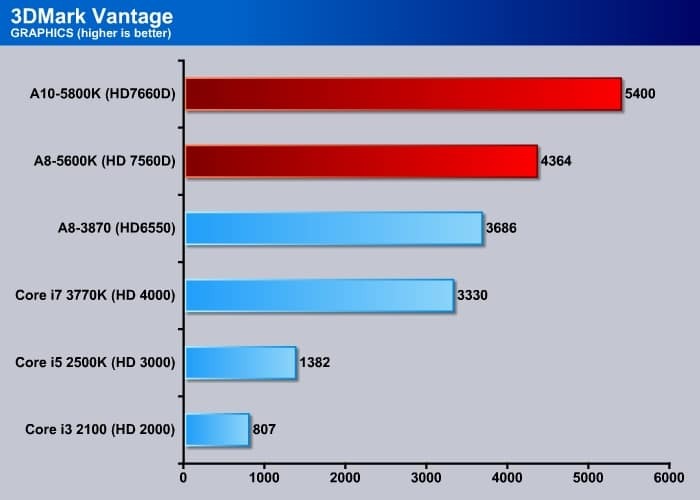 Compare it against the Intel HD 4000, the HD 7660D is about twice as fast. 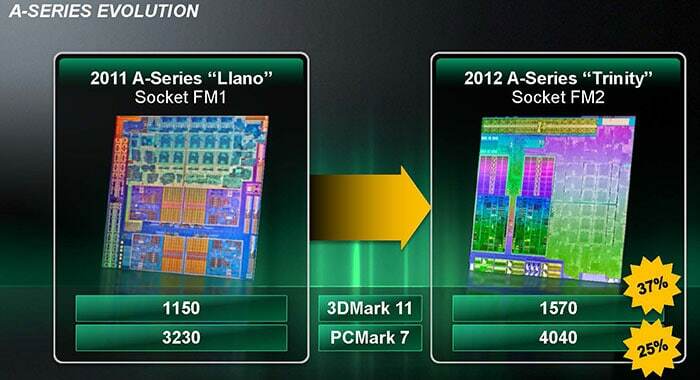 This puts the AMD APU further ahead of Intel’s integrated GPU. Obviously, AMD would want to highlight the importance of a balanced computing experience on both GPU and CPU. On this note, AMD is clearly moving closer to what it is trying to achieve with Trinity. AMD is not alone here. 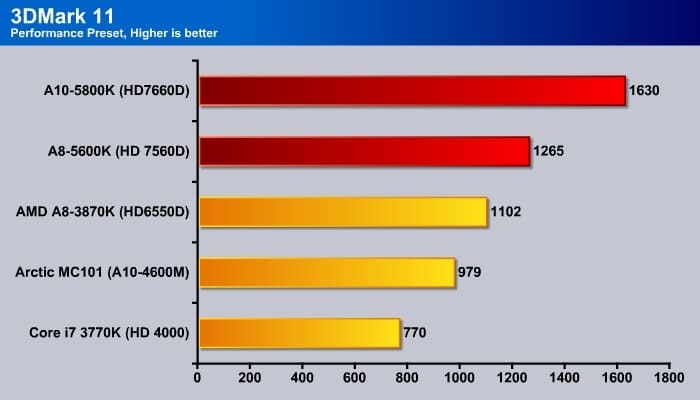 Intel is also pushing GPU performance as well. 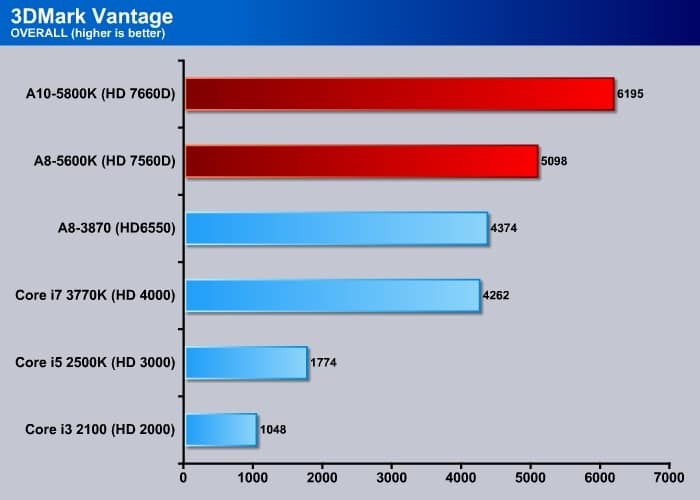 Ivy Bridge’s graphics doubled GPU performance over Sandy Bridge, so it is not hard to see just how serious both companies are trying to provide a good enough integrated GPU. Stay tuned as we have more detail and benchmark results coming in very soon.